Long Beach, Calif. – March 31, 2009 – Formula DRIFT prepares to kick-off the 2009 professional championship season with a host of events leading up to the main competition weekend on April 10-11. Round 1: Streets of Long Beach also marks the debut of new cars and drivers and the return of top drifters from around the world. 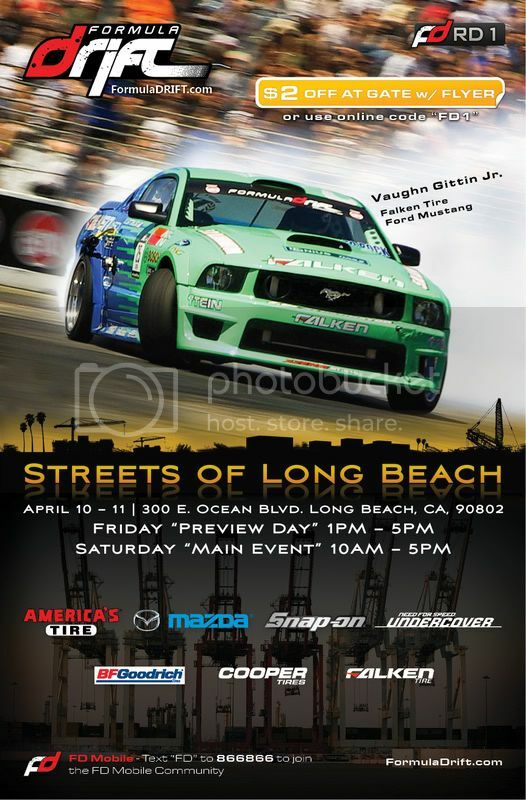 To kick-off the season on Thursday April 9, Formula DRIFT will converge on Downtown Long Beach at 5 PM. The entire roster of drivers and cars will parade from the track into the heart of downtown. The competition vehicles will be on display on Pine and Broadway and fans will have a chance to meet and greet with the drivers. 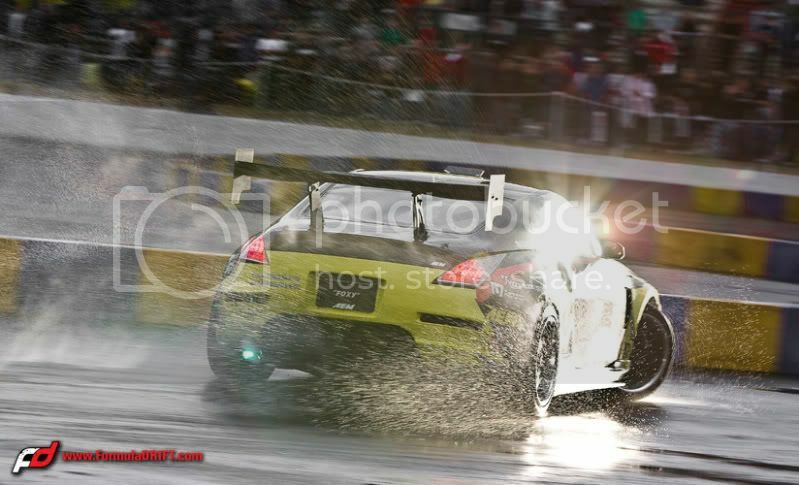 As an added bonus, 2-time Formula DRIFT champion Samuel Hubinette, will be premiering his new DVD “Drift Ya Later,” at Smooth’s Sports Grille. The festivities are free and will go from continue from 5 PM to 9 PM. 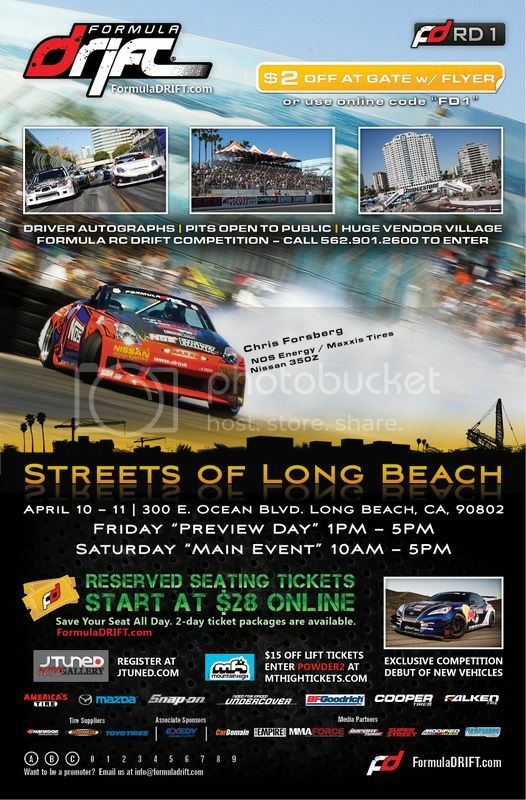 After the first day of Formula DRIFT action on Friday, April 10, Hooters on Pine Ave. in Downtown Long Beach will be hosting a reception for the Formula DRIFT teams. Fans are welcome to join in on the festivities with the drivers. The action takes place from 7 PM to 9 PM. Round 1: Streets of Long Beach tickets are available via the Formula DRIFT website at www.formuladrift.com. Ticket prices start at $28 online for a Saturday reserved seat. Friday, April 10th has been opened to the public as a “Preview Day,” and will feature practice and qualifying. Fans can buy access to Friday’s event for just $5 more. Grandstands 16 and 18 have been expanded this season to give more fans the best view of the action. Taking place during the opening ceremonies on Saturday, April 11, West Coast Customs will be presenting reigning Formula DRIFT champion Tanner Foust with a custom-built GTO. The presentation will be aired on an upcoming episode of “Street Customs” on the TLC channel. West Coast Customs owner Ryan Friedlinghaus will be handing the keys to Foust exclusively at this event. New cars and drivers will make their debut at the season opener. The addition of the Top 32 competition format at this event will give the fans the most excitement and action. The drivers will test their limits on the only actual course that takes place on real city streets. Long Beach, Calif. – February 24, 2009 – Formula DRIFT prepares to begin the sixth professional championship season. Reserved tickets will be available online starting Thursday, February 26 for Round 1: Streets of Long Beach on April 10 and 11. The season opener will feature the world debut of new drift cars, new and returning drivers, and lots more. Round 1: Streets of Long Beach tickets will be available beginning February 26 via the Formula DRIFT website at www.formuladrift.com. Ticket prices start at $28 online with reserved tickets available for Saturday’s competition day. Friday, April 10th has been opened to the public as a “Preview Day,” and will feature practice and qualifying at a minimal cost with purchase of a Saturday “Main Event” ticket. Grandstands 16 and 18 have been expanded this season to give more fans the best view of the action. The action begins on April 10th in Long Beach, California and will be held on a section of the famous Toyota Grand Prix of Long Beach street course. New cars and drivers will be entering the Series and will make for another exciting season. The addition of Top 32 tandem battle will be sure to challenge the drivers and add to the action. Current back-to-back Formula DRIFT Champion, Tanner Foust and World Champion Rhys Millen make their return on different vehicle platforms and will battle against the best drifters for the Formula DRIFT championship.